Hatters boss Nathan Jones admitted that the club turned down bids for defender James Justin and a number of other players during yesterday’s transfer deadline day. The 19-year-old right back had been linked with a move away from Kenilworth Road, with both Brighton & Hove Albion and Leeds United thought to be interested. 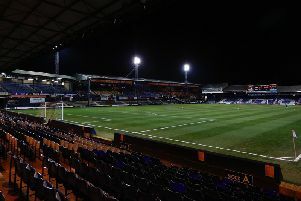 Part of the deal for Justin would have seen him loaned back to the Hatters for the remainder of the season, but although Jones revealed that hadn’t been the sticking point, he remained with the Hatters when the window shut at 11pm last night. The Luton chief said: “I’m not saying that didn’t happen (loan agreement), it’s just his value wasn’t met, his entire value wasn’t met. “Now what we asked from James, as without speaking out of turn or second guessing anything, James is on the rise. "A lot of people want James and for the right price we would be wrong to stand in his way. “But we asked James and his family and his representatives in the summer for a year. “And they haven’t because the standard of clubs he has, without being disrespectful to anyone, last year, that has actually increased, the standard of the league that are interested in him too. “So we’ve upheld our bargain even though it’s been a bit of a stop-start for him as he hasn’t played as many as he probably would have liked, and probably we anticipated it to be honest. “But there’s now 16 massive, massive games where we’re going to need all those players and it’s still within the time-frame of a year that we asked his representatives and his dad and himself. There were rumours surrounding interest in both Akin Famewo and Pelly-Ruddock Mpanzu on the day, although Jones wouldn't confirm which players the club had received offers for. However, he was quick to praise his club’s board for their resolve shown by not cashing in, adding: “We said we wouldn’t lose anyone that we wanted to lose, and the club were true to their word. “We had offers, without naming names or exposing anyone in any way, we had a number of offers for players at our football club and we’ve just been strong as we want to build. “They’re part and parcel of what we do now, and they’re going to be part of parcel of what we do in the future. “We’ve received bids for more than three of our players and if we invited bids, we probably would have got 10, 11, 12. “But those will be confidential what players they’re for and so on, none of them met our value, but we weren’t looking for them to meet our value. “We realise some that we’ll have to move because we would be stunting their development if they stayed here longer term than they would have to. “But at this point in time, no-one’s going backwards and no-one’s value’s diminishing and that’s the main thing. “The club has been strong once again, and what we said was 'can we keep moving forward every window?' And we have. “That’s not big numbers or anything, we have a bigger squad now that we need and for the run-in that will help.